Don't waste money on crappy camping equipment. Owning the best camping gear on the market won't guarantee that you'll have the perfect camping trip. But it sure doesn't hurt. So that you'll have a product (be it a tent, chair, sleeping bag, or something else entirely) that will do its job, last long, and not require constant replacing. Using the best camping gear means not having to think about it. It means you can spend your time enjoying your trip. We understand that there is far more car camping equipment needed then a tarp, chair, and tent--but that's why we have other pages on camping tent equipment. This page here is for the best camping gear for folks first getting into camping, as well as those that love camping and wish to slowly upgrade their equipment to the best gear for camping. True, not everything here is suited for a thrifty budget. When it comes to the best camping tent, you're going to have to be okay with shelling out a few extra dollars. If you enjoy camping on even a semi-regular basis, these products will pay for themselves in no time flat. Why? Because you may never have to replace them. Plus, if you order your car camping equipment from REI, you have a lifetime, 100% satisfaction guarantee. If your tent breaks 5 years from now, return it. No questions ask. The editors at Camping Tent Reviews only buy gear from REI and fully recommend you do the same. So, without further adieu, here's a look at Camping Tent Review's list of the best camping gear. This is a mammoth of a tent. 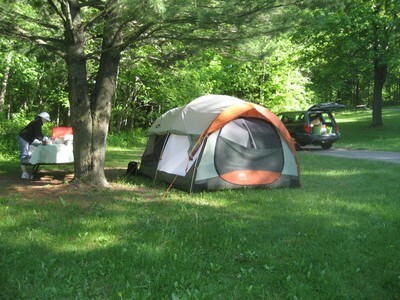 The REI Kingdom 6 Tent is one of the best camping tent on the market for families. It houses 6 people very comfortably, and even features two separate bedrooms, each with its own private door. And yet, even though it offers such luxurious space available when it's set up, the REI Kingdom 6 Tent is highly portable. When folded, it measures only 9.5" x 16.5". There's just no doubt that this is among the best camping gear out there. And at such a reasonable price, the REI Kingdom 6 Tent is sure to please your bank account and your kids. 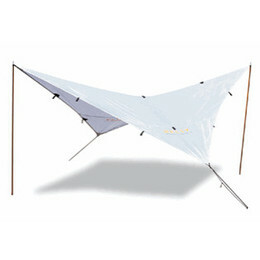 This is a fantastic tarp for all-around camping trips. The Kelty Noah Tarp provides fantastic shade for open-air sleeping, dining, or just lounging around. Versatile enough to be set up in any number of configurations, this tarp will always be able to suit your every need. At just $60 , it's also a great deal. Heck, it's practically a steal. The Roll-A-Chair is an incredibly comfortable camping chair, even though it is able to fold up so small. Especially suitable for car camping trips, where every inch of space counts, the Camp Time Roll-A-Chair is as secure and compact as they come. 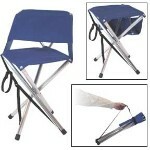 This camping chair features marine-grade aluminum alloy legs, suspended fabric, and great back support.